Jane Hornby’s What to Bake & How to Bake It presents every recipe over several pages with numerous step-by-step photos from raw ingredients, through preparation techniques to finished product. It is a “look and cook” style book and really fun to leaf through. These cookies roll out easily, are rich with dark brown sugar and the Lyle’s Golden Syrup not only adds flavor but helps create the workable texture. We are also featuring her Cranberry Stollen with its moist ribbon of marzipan in the center and don’t miss our interview. These happy little cookies are perfect for an afternoon of baking with children, as the dough can handle plenty of squishing and rolling without becoming tough. The level of spice should please adult tastebuds too. For a darker color and bittersweet flavor, replace the syrup with black treacle or molasses. Put the butter, sugar, and syrup in a large pan, then gently heat until the butter has melted. Beat the egg. Let cool for 5 minutes, then beat the egg into the pan. Mix the flour, baking soda, spices, and salt, then sift into the saucepan. Stir together to make a shiny dough. Turn out the dough onto the work surface, split it in half, then knead briefly to make 2 smooth balls. Squash into flat disks, wrap well in plastic wrap, then chill in the fridge until firm (this will take about 2 hours, or you can leave it overnight). When ready to bake, grease 2 baking sheets with a little butter, then line with parchment paper. Preheat the oven to 350°F. Lightly flour the work surface and use a rolling pin to roll the dough to ⅛ inch thick. Cut out shapes and carefully lift them onto the lined sheets, giving each cookie plenty of space. Squash together, re-roll, and cut out the trimmings. You’ll find the cookies come out of the cutter cleanly if you dip the cutter in a little flour first. For softer cookies, bake for 9 minutes, or until golden all over (they will rise a little in the oven, then flatten out), or for cookies with snap, bake for 11 minutes. Let cool for 5 minutes on the baking sheet, then transfer to a rack to cool completely. Re-use the sheets for the rest of the dough. To make the icing, separate the egg and put the white in a clean bowl. Sift the confectioners’ sugar on top, stir it in slowly at first to incorporate, then beat well until smooth. 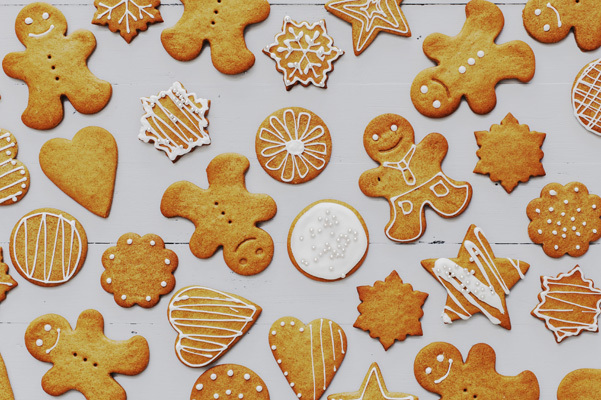 To decorate, either drizzle teaspoons of the icing over your cookies, or spoon it into a disposable pastry bag or food storage bag, snip off the very end and use it to pipe patterns. Decorate with sparkles or dragees, if you like. Let the icing set for about 1 hour or until firm and dry, before eating, hanging on the tree, or packing into an airtight container. ROYAL ICING: Icing made with egg white is known as royal icing. It has a bright whiteness to it, and sets very firmly. You can use store-bought pasteurized egg whites if you are concerned about using raw eggs, or replace the egg white with lemon juice instead. Start with 2 tablespoons, then add more if needed. TREE DECORATIONS: To make your cookies into Christmas tree decorations, punch a hole in the cooked dough (while still hot) using a plastic drinking straw or small pastry bag tip, or something like a pointy chopstick. Take care when handling the hot dough. Thread with ribbon to hang from the tree.